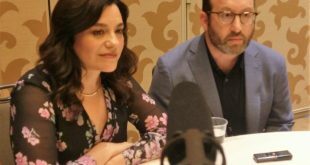 As mentioned in our main Purge article, actors Fiona Dourif, Amanda Warren, and Gabriel Chavarria, who star in The Purge TV show, were also present at SDCC 2018 to discuss their roles in the show and whatever else about it they were allowed to say without major spoilers. Dourif plays Good Leader Tavis on the new show. 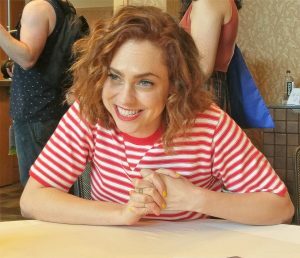 She was recently seen in the TV series, Dirk Gently’s Holistic Detective Agency (2016-17), as Bart Curlish, and is the daughter of actor Brad Dourif, who horror fans will remember as the voice of killer doll Chucky from the Child’s Play franchise. 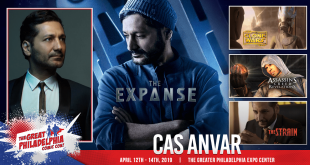 Some of her other credits include Lillian Roth on the TV series The Blacklist (2018), Nica Pierce in films Curse of Chucky (2013) and Cult of Chucky (2017), Dana in the film Arbor Demon (2016), and as Casey in the 2011 season of TV’s True Blood. Warren plays Jane. Her previous credits include Denise in the Academy Award-winning film, Three Billboards Outside Ebbing, Missouri (2017), Mayor Zahra Taylor on NCIS: New Orleans (2017-18), Angelica in the Black Museum episode of Black Mirror (2017), Lynn Jackson in Roman J. Israel, Esq. (2017), and Lucy Warburton on the 2014 season of The Leftovers. Gabriel Chavarria plays Miguel, a U.S. Marine. He was recently seen as Preacher in War For The Planet Of The Apes (2017), played Jacob Aguilar in the series East Los High (2013-16), and was Danny in the Blumhouse Productions movie Lowriders (2016), which also starred Demián Bichir, Theo Rossi, and Eva Longoria. Fiona Dourif: I play a character that was written for a man, which is really fun. I play a cult leader who guides young, innocent children to their death. [She laughs.] It’s so fun. I play a girl who was—a woman, not a girl—who was a counselor, like a drug rehab counselor for kids who were in trouble. [I]t was in that very vulnerable setting that I meet these kids and they come under my wing. I love my children, I love them dearly. [I]t’s in 2018 that women get to play somebody this driven and not sexualized at all. I mean, I could have gained 50 pounds for this role and nobody would’ve ever noticed. It’s fun. [She’s] a strong person. Amanda Warren: Jane’s a very young, driven Ivy League-educated workhorse of a woman with one of the strongest moral compasses I’ve ever played in my professional career. [S]he’s a self-made woman in a white collar finance world in today’s day and age. She’s a good, good woman, good like Juliet of “Romeo and Juliet,” which is the last kind of woman I’ve played next to this character. So with that and with the conflict of the Purge, there’s a lot of changes, and with the changes, a lot of moral and ethical dilemmas that she’s faced with and encounters throughout the night. 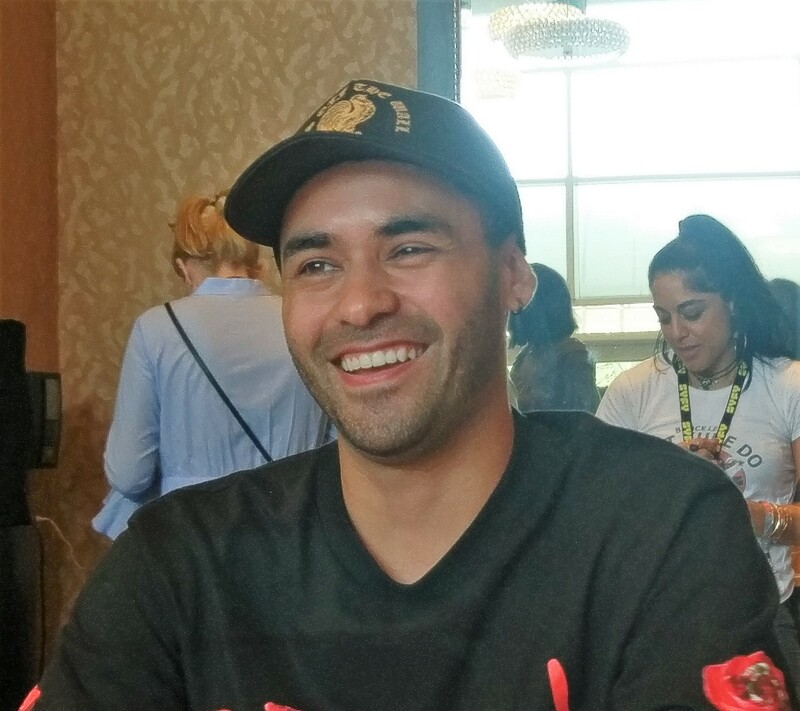 Gabriel Chavarria: I’ve been fortunate to be a part of projects in the past that have had military stuff, that kinda had that role I had to play, so I carried that with me to this project. Who’s my favorite character on the show? I really like Amanda’s character, Jane. Her character is very strong. Honestly, they’re all great, but Miguel is a badass. Dourif: I think the series is really fun. I think courage is a really big idea. I think it’s the perfect format for TV because there’s so much you can do. [T]he whole season takes place on one Purge night, so there’s a lot of violence, a lot of character development. Warren: What I’m most excited about viewers seeing or experiencing with the television series of The Purge is the character development, which my great hope is people will become emotionally invested with [it] because it is 10 hours of really compelling writing, of really compelling storytelling on television. Chavarria: This show is crazy; you guys have no idea what you’re gonna get yourself into. [MILD SPOILERS:] There’s this thing in the show that my character has to [attempt]; it’s called The Gauntlet and it’s basically the American Ninja Warrior of death. [T]hat happens in episode two. So just know at the beginning it starts off right into the madness. I think our creators did a freaking amazing job of creating these characters, creating this storyline, and really exploring what a TV show can do with the franchise of The Purge. Warren: Episode three, and episode five is pretty great. Things really start to happen for [Jane] in episode three. Dourif: I think the TV series might be a little less didactic or not. [T]he social commentary is there, but it’s less than that because there’s so much more time to get to know the characters. I think the coolest element about this show is how creative the gangs are that run around. [MILD SPOILERS:] A woman pushing another dead woman in a shopping cart with her. She was being like a dead vacuum cleaner or something. There was a piñata man—like, there’s a piñata and he’s killed that way. Warren: There’s a lot of different tones, but we stay true to the premise of the franchise. Chavarria: The Purge is perfect for a television show. It’s like watching ten mini-movies for our show. It’s gonna be fun. Dourif: Do you want the answer I’ve been giving all day? “Yeah, all my ex-boyfriends!” But no, I couldn’t kill anybody. I mean, on Purge night, you don’t have to just kill, you can just—it can be mayhem. I think I’d be curious about adrenaline. I’d probably go out. I think you can be anonymous. I think everyone’s in those crazy masks because they’re anonymous. Warren: Well, I’ll tell you right now, I was very reluctant to see the Ethan Hawke feature because I already found it to be a horrific premise because people are capable of anything and everything. It is horrific in its premise, so it took me awhile. I had to wait for it to come to cable television to have my first experience. Mr. Hawke is such a creative force; I was just kind of in it and escaped in his journey and the journey of those around him. [A]nd then Mr. Grillo with the two follow-ups and now Lex Scott Davis, a female leading the pack of the features, it’s really refreshing. 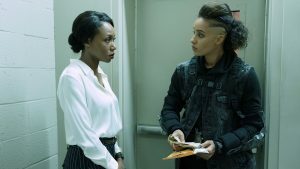 I have to tell you, after seeing The First Purge a week and a half ago, I’m really encouraged about people being excited for the television series. Chavarria: Absolutely. I saw The Purge when it first came out and I thought it was great. I thought it was a very cool, different kind of idea. The ideas [are] a little exaggerated, but it’s fun. I think that’s what makes James DeMonaco and all the other creators great because they turned such a simple idea into this crazy franchise. And then I caught up with the rest of them and they all got better and better. Dourif: What I’ve seen of the pilot, there’s actually not that much; there’s not really gore, but I do think it was pretty successful with suspense. Did you guys see Hereditary? I really liked Hereditary; I liked the pace. But towards the middle end of that movie, I was rolling out of my seat, and the movie theater started laughing, which was really helpful. I feel like it [the show] was like that for me. It was suspenseful, and I think it was successful in creating me wanting to crawl out of my skin without necessarily seeing any gore. I don’t know. I think it works. I think horror fans will really like it. Désirée I. Guzzetta is a freelance writer and poet who loves movies, books, music, and nerdy things, not necessarily in that order.